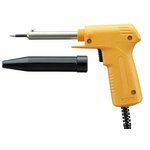 Soldering iron is the most popular and simple hand tool used for installation, repairs, and production work. 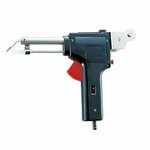 Our product range includes soldering irons with different power sources and different shapes: traditional soldering irons, soldering guns, gas powered soldering irons, battery powered soldering irons, etc. 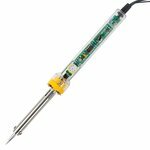 Compact and lightweight lead-free soldering iron with temperature regulation (200-450 °C). Power: 70 W.
A two stage high power heater with ergonomic design. 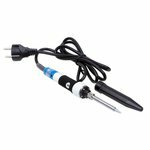 Power consumption: 100 - 110 W.
Precision soldering iron with ceramic heater. 480°C heating temperature. 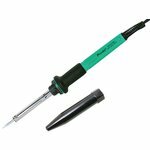 Durable chrome alloy coated replacement tips. 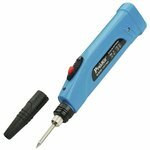 Dual power soldering iron (30 W / 60 W) with nichrome heater designed for ease of operation with the pistol grip handle. With protection cap. 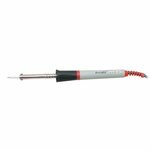 General electronics soldering iron KS-30R/22 with nichrome heater. 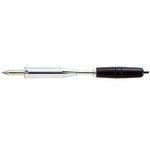 This is general purpose for electronic and hobby work and for work at home. Two stage high-power heater with ergonomic design. 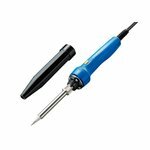 Compact high quality soldering iron, long-life iron-plated tips for greater efficiency, ideal for a wide variety of electronic and electrical work. 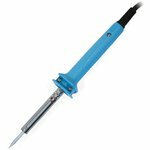 60 / 30 W soldering iron with manual solder feed mechanism. 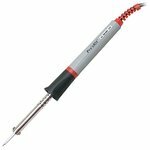 Compact and lightweight soldering iron with high output ceramic heater (75-110 W). 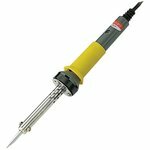 Soldering iron used for sheet metal soldering. 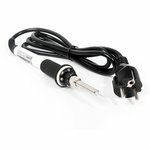 Power: 300 W.
Compact high quality soldering iron (220-240 V) with power consumption 40 W, tip operation temperature 480°C. 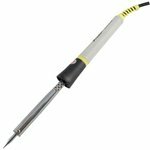 Powerfull ESD-safe soldering iron (100 W) for computer and radio electronics equipement repair, made of high-quality materials. 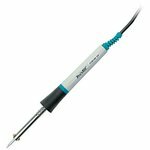 A compact high quality soldering iron with long-life iron-plated tips for greater efficiency, ideal for a wide variety of electronic and electrical work. 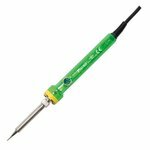 Soldering iron (230 V), power consumption 60 W, tip operation temperature 450 °C. 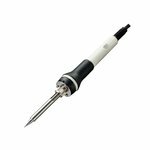 Safe in operation and meets the quality standards. 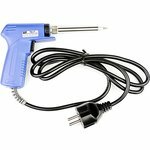 Low-power soldering iron (30 W) with a plastic cap. 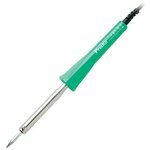 Replacement tips: Pro'sKit 8PK-S120N series soldering tips.